This November, Twinkle’s project manager, Marcell, and communications manager, Anita, went to Brussels to visit the European Parliament. We were invited by Europlanet, Europe’s community organisation for planetary science, which had in turn been invited to take part in events and an exhibition for the 8th European Innovation Summit (EIS) and the Science and Technology Options Assessment (STOA) Annual Lecture. It was an interesting few days in which we talked to many Members of the European Parliament, their assistants and policy advisors, members of the Commission and visitors to the Parliament. Other companies attending the EIS ranged from a start-up to use drones for air-cargo to a company that used a serum derived from snails for skin products. EIS sessions covered a wide range of topics, including European funding for science and technology, disruptive technologies and promoting STEM education. 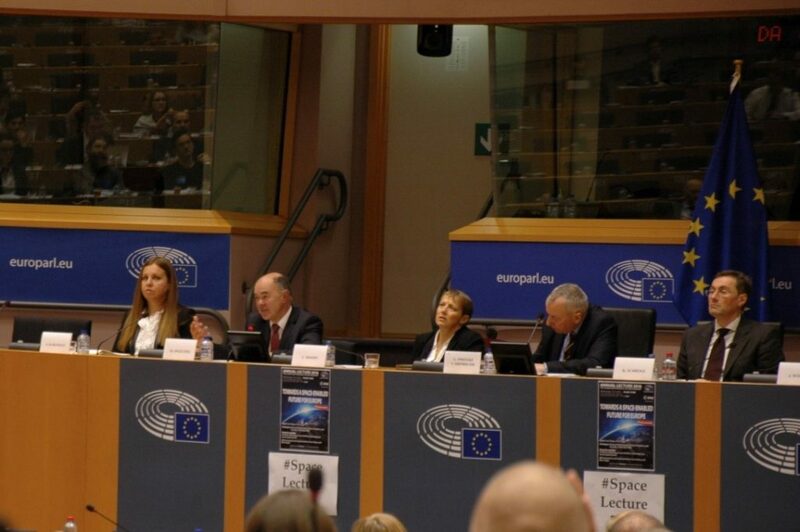 Prof Sir Martin Sweeting, CEO of Surrey Satellite Technology Ltd (the company that will build Twinkle) gave a keynote address at the STOA lecture about how small satellites have changed the economics of space. You can watch a webstream of the lecture here. A real highlight was the opportunity to explore Mars in the exhibition through a Virtual Reality experience that used real data from NASA missions to the Red Planet. It may be some time before we can experience planets beyond our Solar System in such a realistic manner, but we’re proud that Twinkle will provide the first steps in helping us find out what exoplanets are really like.